Today I decided to go a different route than jewelry and shoes, two things I am obsessed with. I am currently obsessed with buying a new house and decorating it…. 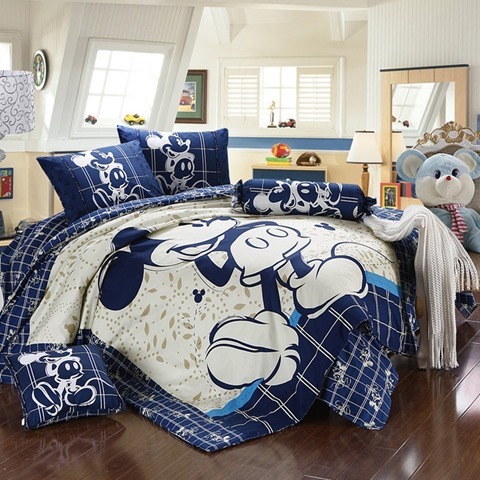 so I bring you Disney bedding! This is a Queen 4 Piece set Featuring a duvet cover, 2 pillow cases and a sheet. It has Mickey standing proudly and I love that the coloring is neutral so it would work for men and women (or couples that are trying to agree on colors). Let’s get some more details and take a look at the overall picture. So this set is 100% cotton and, therefore, machine washable. This is something I need in life because dry cleaners get expensive!! I love the blue stripe along the lower edge of the duvet cover as it gives it a little extra something. The bolster pillow and the square pillow on the floor are not included but I do like the fact that if I wanted to add those things to the look, I would be able to find them. I believe the sheet that comes with the set is a flat sheet, not fitted but that just means I can use that fun blue stripe and get a fitted sheet in that color to make it pop even more. The measurements are as follows: Queen(4pcs),1duvet cover:78”*90”, 1bedsheet:91”*96”, 2pillowcases:19”*29”. The retail price is $69.00 plus shipping which I think is pretty reasonable for a 4 piece set. If you are interested in my newest Disney discovery, click here. I’m really sorry but I have no idea. That post is 2.5 years old. I’m not sure anywhere would have it anymore. Maybe try ebay?